Whether you began your career in West of England aviation as a pre-war apprentice at BAC or have only recently joined a company in the city-region, we'd welcome your anecdotes and comments about your experiences. When I was an 18 year old Canadian in Montreal in 1955, I sailed to Liverpool (the great majority saoled rather than flew in those days)and went to Bristol to start my Apprenticeship in Aeronautical Engineering with Bristol Aero Engines. I had an arrangement with E.G. Sterland (Director of BAC Apprenticeships) to do the usual 'summer before university', 'summers while attending' and the year post-graduate - all in one period of 3 years (1955, '56 and '57) - and to return to McGill University in Montreal to complete my B.Eng. degree. I'm now retired from a wonderful career, including working for Bristol's Winnipeg Division (1958), Canadian Pratt & Whitney in Quebec ('60-'64) and 30+ years in the computer /IT industry. But it all started woth those initial, wonderful three years at Bristol Aero Engines Div. of BAC in Patchway and Filton. Thank you BAC - and thanks for this wonderful website. We've had a query from Marion Homer who lives at Elborough Village which was built on the site of the old BAC/ BAJ factory Banwell. Her late Father worked at the factory and she is trying to obtain as much history about the area as possible. We've recommended the book "Shadow to Shadow" on BAJ which is available to borrow through Libraries West. Does anyone have any other suggestions? If so email bac100@btinternet.com and we'll pass them on. Thanks. Jonathan Falconer has contacted BAC 100. He'd like help tracing info about his late grandfather, Wg Cdr Lofty Owen, who joined the guided weapons division in about 1956 on his retirement from the RAF, eventually retiring from BAC in 1970. He believes he was a technical author on the Bloodhound programme. Does anyone remember him? If so, contact bac100@btinternet.com and we'll pass on a message or add a message of your own on the Comments section at the bottom of the article Now It Can Be Told. 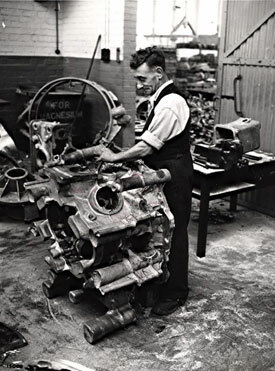 I was an apprentice engineer in the Aero-Engine division 1955-1958. I was a CANADIAN teenager from Montreal - who dreamed of designing gas turbines. And so I sailed to England in '55. The course was usually a year before university, the summers while attending and a year 'post-grad'. - but I did that all in one 3 year stint, returning to Montreal to attend McGill University. I owe a whole life of engineering to the wonderful people and friends in Patchway and Filton. My five year Student Apprenticeship 1953-58 in the Aircraft Division at Filton was an excellent grounding, in both practical and academic aspects of aeronautical engineering. I went on to obtain an MSc in Aeronautical Engineering and a lifetime in aerospace, both as an Engineer and military pilot. I owe a great deal to the education and skills I developed during my time at the Bristol Aeroplane Company. For me, that time is well worth celebrating, especially if encourages other young people to follow a similarly challenging and rewarding career path. I designed a lot of forging blades. All the blades in the engine were made from precision forgings, and it was quite a specialist job designing them. I was 16 years on the drawing board, and 25 years on production control engineering. I was lucky in that I always had a job that was interesting, and a job that didn't always tie me to a desk. The rule was you could walk anywhere as long as you could clutch a piece of paper, because if someone saw you with a piece of paper, they assumed you were on a mission, and they were scared about challenging you in case they got involved in the work. You could walk all the way around the factory clutching your piece of paper; wander around the different flight sheds looking superior, because there wasn't the work there. Man working on Centaurus casing, c 1950s (Rolls-Royce plc).